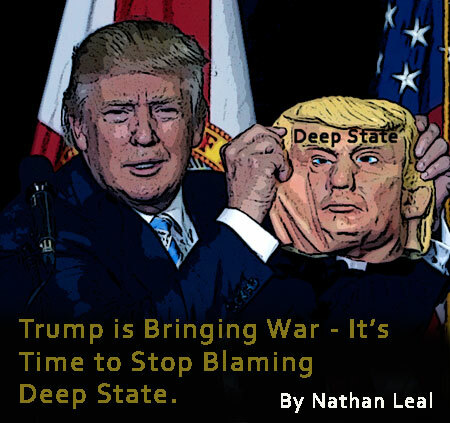 Home Articles Trump is Bringing War – Time to Stop Blaming Deep State. 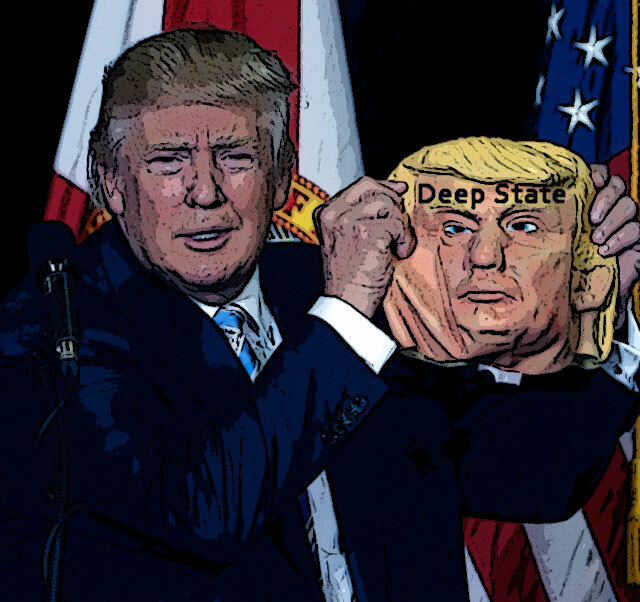 Trump is Bringing War – Time to Stop Blaming Deep State. By now, it should be obvious that it wasÂ all theater. …A deception whose mission has been accomplished. Ladies and gentlemen, Trump’s arrival in the White House was not a miracle of the people. He was chosen. He was selected. He was the means to their end. But many evangelicals did not see it. They believed the voices of the watchmen on the radio who told them that Trump was God’s man. But now the truth has come out. Trump is not God’s man to bring greatness. Instead, he is the man to bring war. If the watchman had been doing their job, they would have seen Trump’s true colors. Are these strong words? Yes they are. Because they failed to tell you the truth about Donald Trump. And worse, they failed to see it themselves. But are they admitting that they missed it? No. Many of them are now blaming Trump’s woes on Deep State. Deep State did not appoint Wilbur Ross the Rothschild alumnus to be on Trump’s cabinet….Trump did. Deep State did not appoint the many Goldman Sachs members to be on Trump’s cabinet….Trump did. ….Nor did Deep State appoint CFR members, or Bilderberg members to be entwined in the Oval Office. Deep State did not choose billionaires who took part in exporting thousands of American jobs overseas, it was Trump who chose them. Trump chose Paul Manafort, the compromised Russian lobbyist. Trump chose Michael Flynn, the compromised Russian lobbyist. Trump chose Steve Bannon, the one who wanted to destroy everything. And bring America crashing down. Trump chose Stephen Feinberg, the CEO of Cerberus Capital Management to be on his team and oversee Intelligence agencies. Which means Feinberg’s job will be to spy on the spies. Deep State did not force Donald Trump to borrow 312 million dollars from George Soros to build a tower…. Donald Trump made deal with Soros, all by himself, which proves that they are not enemies. I could go on, but Deep State did not appoint these insiders to the Trump team or the Trump Universe. The biggest ruse in modern politics has taken place in the United States of America. Donald Trump was used to deceive evangelical Christians into thinking that he was going to make a difference and restore their beloved country to pseudo-greatness. In truth, Donald Trump opened the exit door, and allowed the very elite who were once touted as being the enemy, to enter the Oval Office and begin making policies that will take America into a season of horrible darkness, calamity, and war. The Neocons never left folks. They are swimming in the Oval Office. I know that many evangelicals feared that if Hillary got elected, war would come, so they denied her the presidency. But the globalist knew this was going to happen. So through the crafty use of the Hegelian Dialectic, they made Hillary the villain, and selected a false hero for the people. That man was Donald Trump. He was selected to be the alternative. And he was also promoted as an outsider and newcomer, who would bring glory to America. Positive prophecies were made about him. Unfortunately, those prophecies were false. Let me say that again. The Mark Taylor prophecy about Donald Trump is a fallacy. And it has now been exposed to be a lie. The same goes for the prophecies of Lance Wallnau. Mark Taylor’s prophecy said that Donald Trump would be a man of his word. In the past 100 days, Donald Trump has proven that he struggles telling the truth. During his campaign, Donald Trump touted America First. He said that he did not support America’s efforts to police the world with war. But now, Trump has flip-flopped and is about to start World War III. And many people are going to die. Why? Because Trump was chosen to be the war president. His billionaire buddies knew it. I have been warning about it since Trump began his campaign. I stated publicly that Trump was going to bring war. How did I know? Because the Lord revealed that war is coming years ago. America is under judgment folks. America’s judgment will be made up of four portions. I call it the four fold judgment. The four parts include; famine, pestilence, evil invasion, and the sword. The sword judgment consists of war. And it is on its way. Ladies and gentlemen, Donald Trump is going to bring war. I repeat, Donald Trump is going to bring war, which means death is coming to America. War folks! And it’s going to be horrible. Because America has an appointment. Her cup of iniquity is full. And God is going to pour it out over the land. When the liquid touches the ground, the earth will shake with a thunder. Mountains will quake. Trees will shudder. And men’s hearts will faint. …which will bring one bad day to America. It is coming ladies and gentlemen. And it’s not going to happen because of Deep State. It is coming because Donald J. Trump was chosen to bring fire and death to America and the world. He projected this during his inauguration. He told all of his what he was gonna do. During his inaugural speech, he sent a subtle message to those with the eyes to see. Do you remember it? 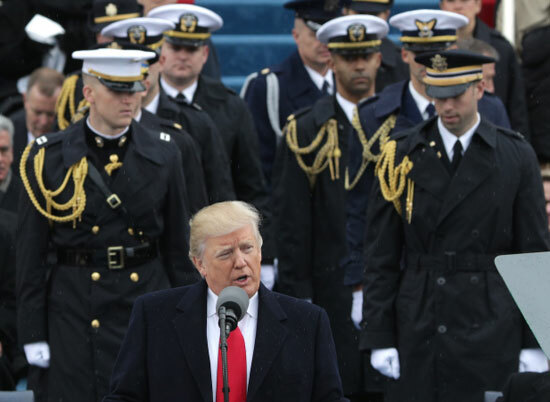 A few minutes into his speech, ten military officers stood behind him and said nothing. They represented five branches of the military. And Trump’s message was obvious…. Which was this – As president, heÂ would have the US military standing behind him as he led the military to war! It is coming my friends. Even now as I type these words, the US military is preparing for war on several fronts including: North Korea, Syria, Iran, Russia and China. The US government is also preparing for a false flag attack on American soil. Another 911 is coming folks! It may be a terrorist attack, an EMP, an attack through plague or epidemic, or something else. But it’s goal will be to bring America under martial law. In conclusion, a great horror is approaching. It will bring shock and awe to the strongest among us. And it will destroy those who are the weakest. I cannot say this enough folks. People are going to die. So it is up to you to make sure that your life has been submitted to God. Get your houses in order. It is time to repent. It is time for all of God’s people to examine themselves and take spiritual inventory. Make sure that your relationship with Jesus is strong. Nourish it my friends. I also want to encourage all of you to inventory your physical preparations. Make sure you have stored food, if you lost power for 3 to 7 days, would you make it? What if it happened for a month? Three months? These are things that must be examined and considered. Fill your lamps with oil. Your hearts with God’s Word, and your storehouse with food.